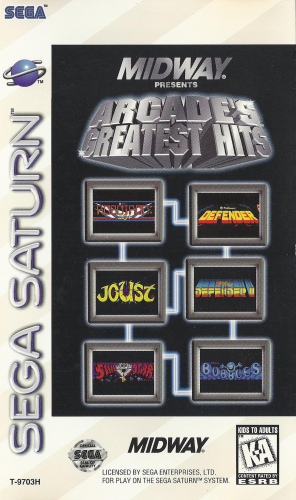 Some of the greatest arcade games from the 1980s come to the Saturn in ARCADE’S GREATEST HITS. Get rid of the dirt in BUBBLES. Navigate through enemy territory and try to save the humans in DEFENDER and DEFENDER II. Turn your opponents into eggs in JOUST. In ROBOTRON 2004, you will have to fight hordes of mutant robots to protect the last human family. Get ready for outrageous space battles in SINISTAR. All of the games have their classic graphics and sound. Remember what great games are really about with ARCADE’S GREATES HITS.